There has been condensation appearing on the windows which to me means autumn days are on the way. 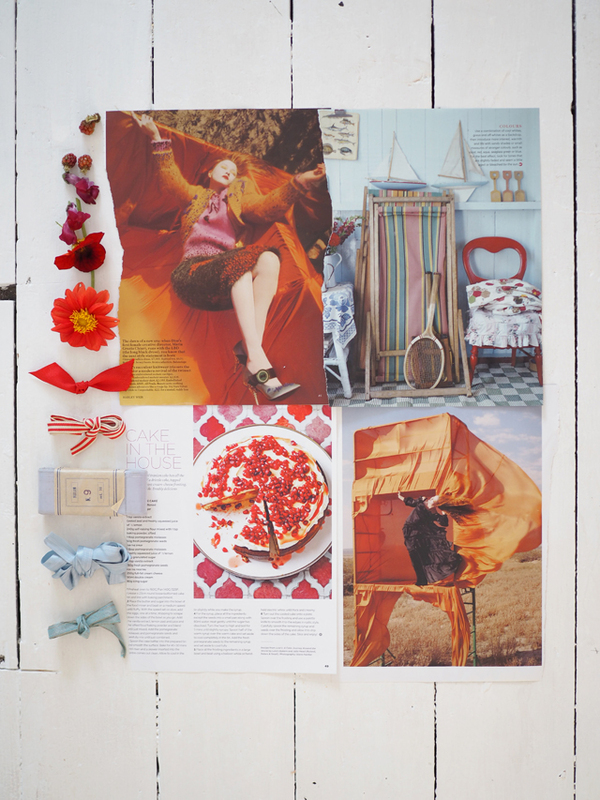 For this months inspiration I'm really enjoying these rich orange and red tones mixed with a dash of cool blue. This collection of images wasn't intentional I was clearing the pile of magazines by my bed and these came together, I'm drawn to the sense of freedom and movement each image represents. The last few weeks of pregnancy have made me feel a bit stagnant so maybe my subconscious is telling me I'm ready for a new adventure which I'm sure this month will bring. New baby aside, I'd like to spend a little bit of time over the next few months working on improving my photography. I'm happy with how my photos are but would like to try some new ideas as I always rely on a formula that works for me as time is tight. I'd also like to pick up my calligraphy pen again, I went on a course a few years ago but never did anything with it so would like to give it another try. Hi, I love your blog layout! So neat and looks just lovely - and so is the content. By the way, did you hear about a brand new Microsoft Dynamics edition, meant for Operations and Financials? If not, then you might want to check out my website.